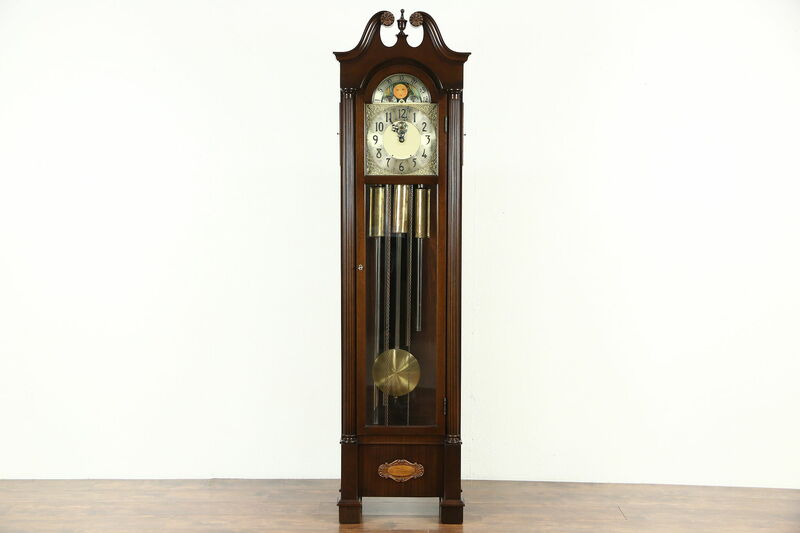 Signed by the most famous of American tubular chime grandfather or tall case clocks, "Herschede," this vintage clock from about 60 years ago has a mahogany case with an excellent restored finish. The brass movement has been professionally cleaned and oiled and keeps excellent time. It plays the familiar Westminster melody, a longer part of the tune on each quarter hour, also counting the hour on the top. Contact us to hear the soft and resonant chime. A pull chain winding runs for a week, there is a silent lever on the side. The lavishly engraved and embossed filigree dial has the crown symbol of "Herschede." There is a shadow from a removed presentation plaque. Measurements of the classical case are 21 1/2" wide, 12" deep and 81" tall.